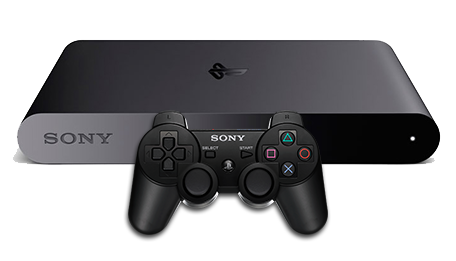 You can also enable Automatic DualShock 3 Bluetooth pairing if you wish. 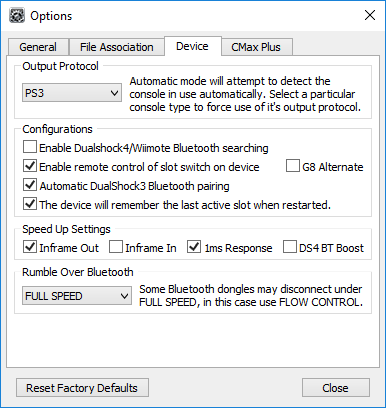 The recommended Speed Up Settings when using a DualShock 3 Controller with a Bluetooth 4.0 USB Adapter are as above - you can choose to tweak with them if you have any issues. If you have a slower Bluetooth adapter or experience any issues with rumble then you should try different 'Rumble Over Bluetooth' speed settings. You have the alternative options of Flow Control+, Flow Control and Disabled. You can now close the Options window. Connect your Bluetooth USB adapter into the Input Port of the CronusMAX PLUS. If you need to purchase a good quality Bluetooth 4.0 USB Adapter, our store supplies them at discounted rates - click here. 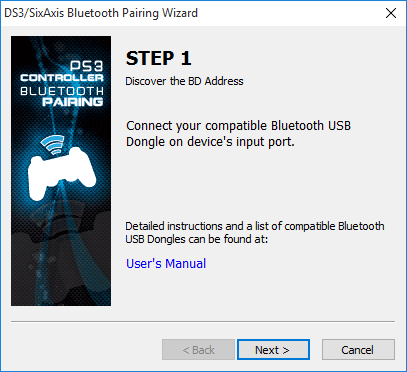 Step 1 of the DS3/SiXAxis Bluetooth Pairing Wizard will appear. Click Next to continue once the Bluetooth USB Adapter is connected to the CronusMAX PLUS. Step 2 of the DS3/SiXAxis Bluetooth Pairing Wizard will appear. This stores the details of your Bluetooth USB Adapter. 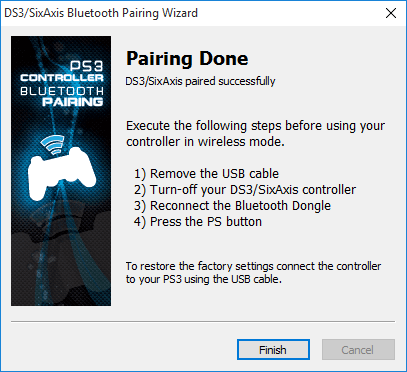 Disconnect the Bluetooth USB Adapter from the CronusMAX PLUS and using a Mini USB Cable, connect your DualShock 3 controller to the CronusMAX PLUS then click Next. The CronusMAX PLUS has now paired your DualShock 3 controller with your Bluetooth USB Adapter. 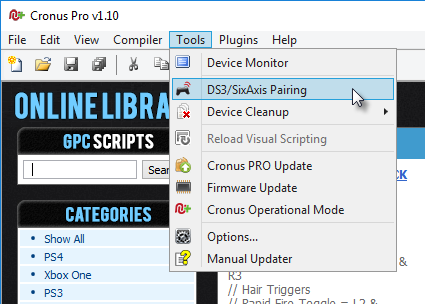 Disconnect your DualShock 3 Controller from the CronusMAX PLUS and unplug the Mini-USB Cable from it. You can also disconnect the CronusMAX PLUS from your PC. If your DualShock 3 remains powered (The player LED's are lit or flashing), press and hold the PS button on the controller for 30 seconds or until the LED's turn off. Connect your Bluetooth USB adapter back into the Input Port of the CronusMAX PLUS. Turn your DualShock 3 Controller on. Press the PS button on your DualShock 3 controller to turn it on. Bluetooth and Wi-Fi devices use the same radio frequencies to communicate, they often interfere with one another and are prone to interference from other devices operating on the same frequencies. If you are experiencing lag with your wireless controller, even though you have tried different Speed Up Settings in the Device Options panel, there is a good chance you have a WiFi Router that is causing interference. We have found that routers such as Apple's Airport Express have this problem and you should make sure that the router is not in close proximity to your CronusMAX/Bluetooth Adapter. You should also try changing the WiFi Router Channel to optimize your wireless signal. Click Here for more information on how to do that. We also recommend that you Click Here to check out an article that looks at the effects of such interference, what causes it and how to reduce it in a home or office environment.